The Walkstool Comfort comes in four different models with sitting heights 18"", 22"", 26"" & 30"". All models have two sitting heights, with and without extending the telescopic legs. The smallest model features a large and comfortable seat size, which increases on the larger models. The Walkstool can be used in a low position, or with the aluminum telescopic legs extended. Walkstool Comfort is extremely durable and offers big rubber feet and an ergonomically shaped seat of mesh material, making it possible to sit comfortably for extensive periods of time. 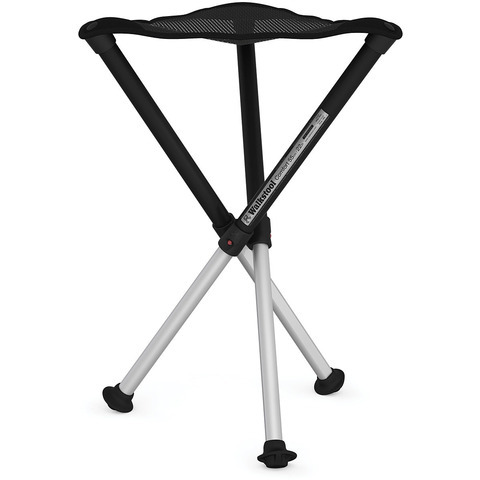 Lightweight & compact, the Walkstool is perfect for any occasion! When not in use the telescopic legs ""lock"" with a twist of the legs for easy carrying. Made in Sweden, patent and trademark protections. Walkstool 18": Max Height: 18", Seat Size: 14", Max Load: 440 lbs, Weight: 29 oz. Walkstool 22": Max Height: 22", Seat Size: 15", Max Load: 495 lbs, Weight: 32 oz. Walkstool 26": Max Height: 26", Seat Size: 16", Max Load: 550 lbs, Weight: 34 oz. Walkstool 30": Max Height: 30", Seat Size: 16", Max Load: 550 lbs, Weight: 37 oz. Walkstool Steady: Protects rubber feet from sinking into the ground.